Disclaimer: Some links from this website may contain affiliate links, which means I will earn a small percentage of commission if you choose to make a purchase at no extra cost to you. However, I will only recommend and endorse products which I use so I know they will be beneficial to you as well. In this video, I will share more about my background and the struggles I’ve faced in my previous business ventures. 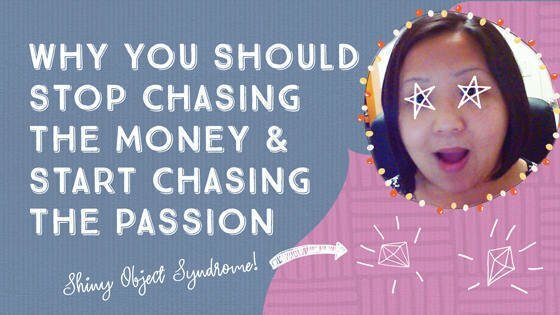 I will also share how having the ‘shiny object syndrome’ had led me into a pool of debt, how I climbed my way out of debt and what I plan to focus on right now so I am on my way towards true success following my passion. 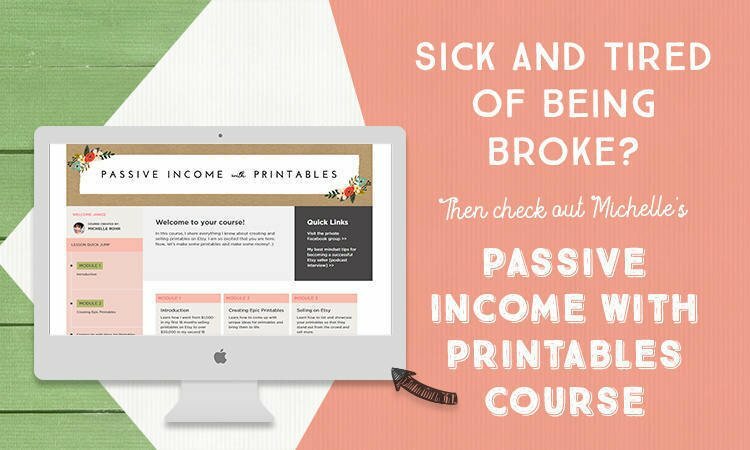 If you were in the same boat as I was, and want to get out of debt and pursue a business that’s truly profitable by designing printables from home, then – you should check out Michelle’s course. 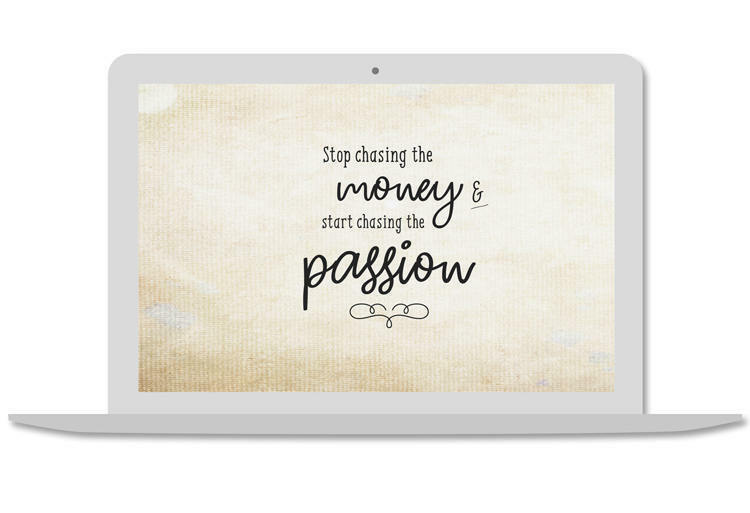 Also to complement my video this week, I’ve created a Free Wallpaper of the same quote in my video; to remind you to always follow your passion no matter what. 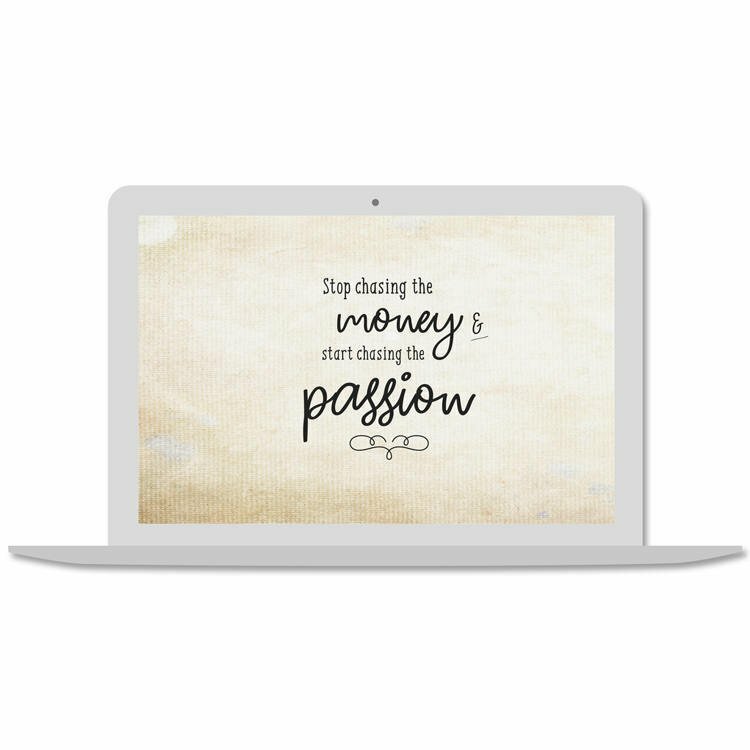 Download the Free Wallpaper by clicking the Download Now button below (no sign-up required). Here’s a wallpaper to remind you to always follow your passion no matter what. Disclaimer: Some links from this website may contain affiliate links, which means I will earn a small percentage of commission if you choose to make a purchase at no extra cost to you. For your information, I will only recommend and endorse products or brands which I use. OMG I can’t even begin how grateful I am for all the things the Lord has done in my life. I may seem like a really happy person to you, which I am. But like you, I too am only human and had gone through a tremendous amount of hardships and struggles in my life. I am happy because I have always practice this feeling of gratitude in my heart. I am quite an easy person to please (for most things) and have always been grateful for every little thing that came my way or every kindness that was shown to me through someone’s actions. And so I have made this video about the 18 things I’m VERY grateful for from 2018! This is a great exercise for me to reflect about my wins and there are just SO much to be thankful for. And I hope you will join me and do the same. 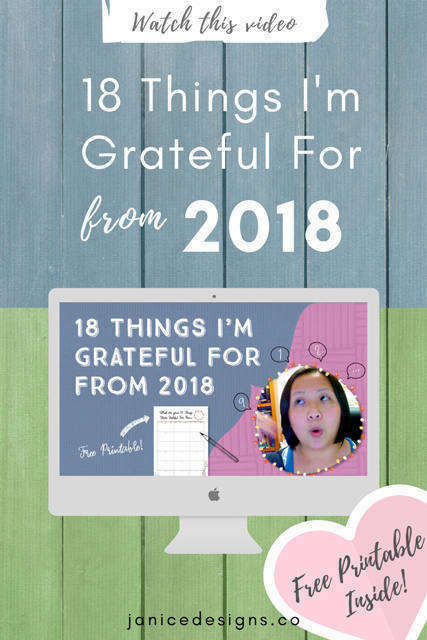 To create the same mindfulness for my subscribers, I’ve also created a similar printable to Michelle’s so you too can write what you are grateful for from 2018.. I left it undated, so you can re-use this printable for every year. It will be in my Free Printables Library. You need to sign up by clicking the image above to access this freebie and a whole lot of others :). If you have already signed up, you can head over to your free library right now. 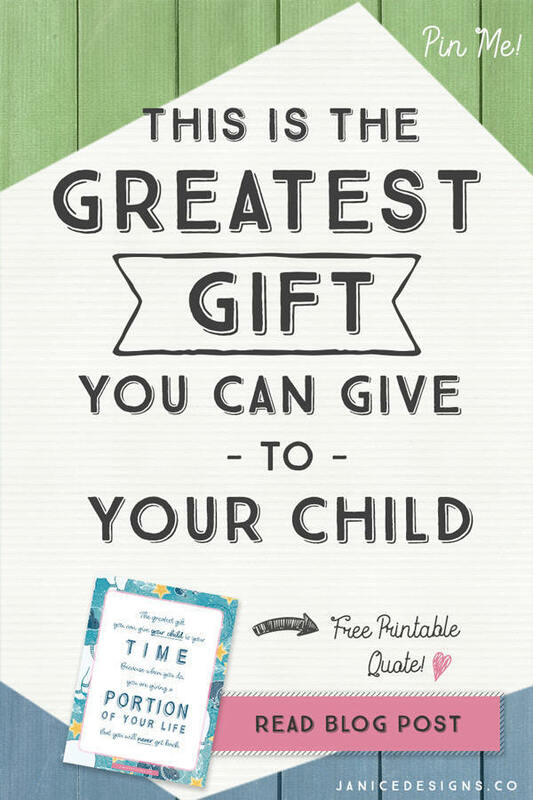 Click on the image to download your Free Printable! Or Pin this Image to Your Pinterest Board! 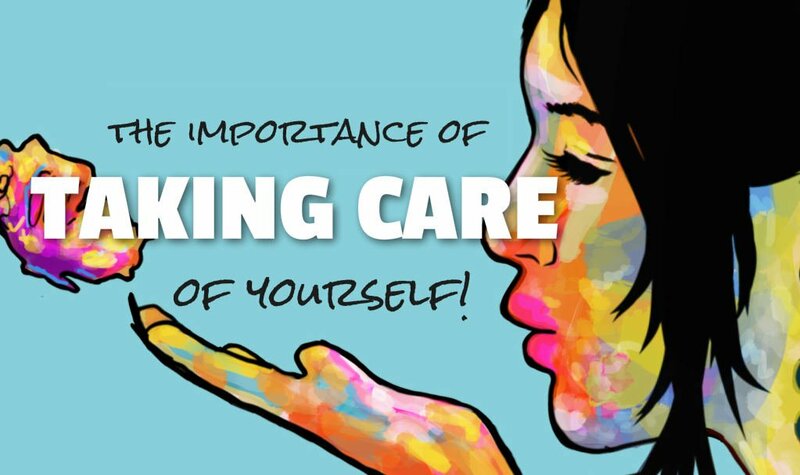 I am quite passionate about this topic because if you are sick and tired of being exhausted ALL the time (due to stress, work, kids, school, exams, business etc.) then this video and post is for YOU. You see, I’ve been where you’ve been.. not for weeks. Not for months.. but for YEARS! Everything took much longer to accomplish. Which means less time to work. And housework not done. My clothes pile started from a small hill and now, to a MOUNTAIN of clothing! Not quite as literally – but you get my point. So I naively thought that the more I work, I would accomplish much more. I was just busy being BUSY. And although yes, I did manage to accomplish some urgent and important work.. I ended up feeling stressed, overworked and utterly exhausted.. I couldn’t keep up.. to the point I couldn’t think straight and I was dozing off at my desk! Now when I think back, I was kinda pathetic. I also took in more work than I could chew.. because I was this ‘yes’ kinda person. Not to mention – I’ve developed this “shiny object syndrome”. 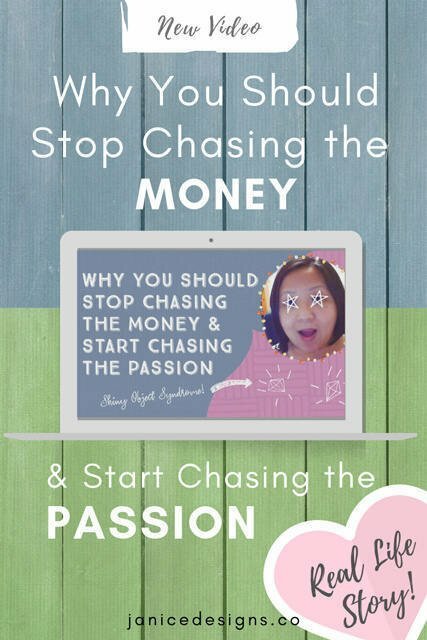 Jumping from one idea to another, from one course to another, from one ‘best’ making money online method to the next… Oh my gosh! It was exhausting. And this went on and on and on…and on…. If you can relate, then you are NOT alone. Now, up to this point, my husband, Peter was already telling me to go to bed if I’m tired and not overworked myself. He’s the kind of guy who goes to bed on time every single night. He does a good job at work. Is VERY good at what he does. He is productive and focused – everything I feel that I am not. (I get distracted a lot, you see). Then maybe I could make sense of it all. “I’ve got only ONE section LEFT!” and then, the next thing you know – 3 hours have gone! But I paid dearly for it. My mental, physical and spiritual health were NOT so great. I was sleeping 5-6 hours sleep every day (because my youngest would wake me up for a feed in the middle of the night). I wasn’t eating well and chose the wrong foods because I was just TOO tired to make myself a proper healthy meal. I became too tired and lazy to spend even a few minutes with GOD. Excuses, of course. And I couldn’t think straight. I wasn’t as productive. Ideas were not flowing. I couldn’t focus on one single task. Everything was mumbo-jumbo and a MESS! I’m sure you are just as exhausted hearing ALL of this.. maybe even annoyed at my foolishness (and I don’t blame you if you feel this way). I knew I couldn’t keep doing this to myself. I was frustrated and ANGRY at myself for letting myself be this way. I would kick myself if I could. Hah! But God is SO good to me… it’s as if He heard my soul cry out for help. And I desperately NEEDED it. A phone call came from my children’s daycare one day and offered me a 3 MONTHS worth of free daycare service for siblings that go to the same center. Hey, what do ya know.. It was an offer I COULD NOT refuse. I said yes, almost immediately. I felt like I could breathe again. But it took some divine intervention on HIS part to knock some sense into me. Quite literally. To stop and take a breather and not have a care in the world. Then maybe… just maybe, I will be able to think straight and focus better. I will also probably make better decisions and stop all this mumbo-jumbo, shiny-object syndrome and stop wasting my time and money on things that do not matter. My sleep is improving as well, but it is still not perfect. This will always be a process for me and will continue to work on it. I also have decided to live my life with more intention and focus on the most important things that will bring me success. I have made an effort too, to exercise at least 3 to 4 times a week now. And make healthy food choices. I feel strong. I feel at peace and a sense of satisfaction, knowing that my life and business is heading in the right direction. My head is clearer and I can focus better as well. Inspiration and ideas are coming to me from left, right and center! And I feel incredibly INSPIRED. All the exercise and healthy food choices are definitely helping my mental clarity. I have started losing weight too – which is a bonus. And I will continue to work on it as I have a LONG way to go before I reach my goal weight. All these good things started to happen ONE by ONE, because I have decided to take one day of the week to FOCUS on taking care of myself. And I want the same for you too. You don’t have to wait until you feel like dying or when you are utterly burned out. Learned from my mistakes. It will save you a ton of pain and regret and MONEY in the long run. And your body and mind will thank you for it. 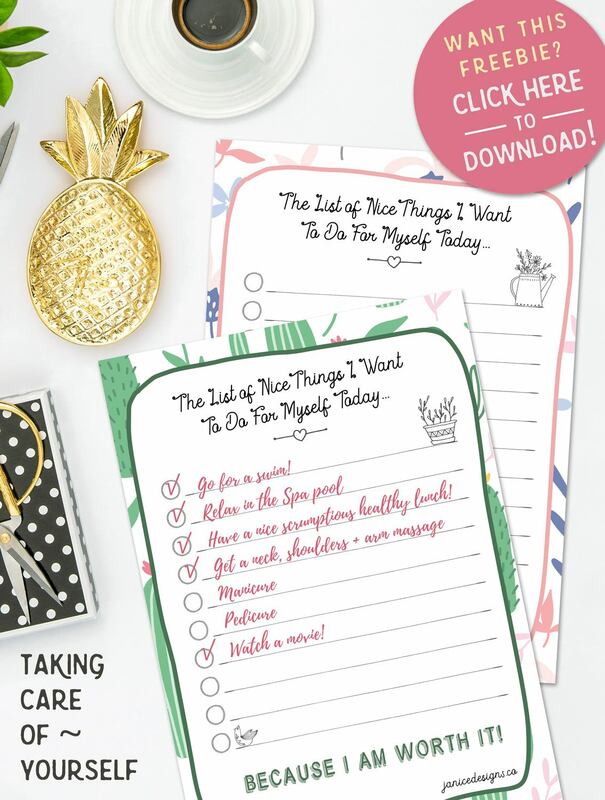 And that is why I have created this Free Printable for you to list out the nice little things you are going to do for yourself this week! And when you do, comment below and tell me what fun things you have you been up to, so we can bounce ideas off each other to keep things interesting each week! It’s been a long time since I’ve posted anything. Family life and design projects (after projects) have kept me pretty busy. Forgive me for not keeping to my promise. 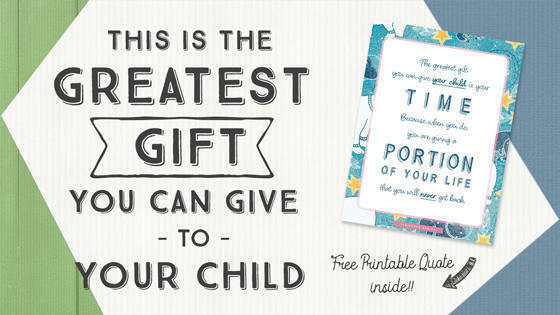 The plan was to keep in touch with you and giving you heaps of FREE PRINTABLES. Both of which I did not do due to family commitments. I guess having 4 children has taken a huge toll on my time, mental and physical health especially when exhaustion kicks in. As the pun goes – I have bitten more than I could chew. (WORK that is). Don’t get me wrong, I LOVE my kids. And sometimes it is a challenge to distribute your energy and time to every child (especially if you have more than 1). But it is SO important to do so – so your child(ren) will continue to feel loved and cared for. And that is why I LOVE this quote above so much. If you’re already a subscriber, you can download this lovely quote here for FREE! I wanted to write today because of my eldest son, Michael. You see, him being the eldest child in the family, he gets all the perks of having the newest clothes, toys and the first to do all the ‘big boys’ stuff – like experiencing the more challenging outdoor activities and games compared to his other siblings. While his siblings get ALL the hand-me-downs clothing, toys, and limited challenging outdoor plays and activities. But you see, being the eldest ain’t all that rosy. As a parent, I have a lot of expectations of him because I needed him to be a good example to his siblings. I always tell him, “Michael, you’re the eldest, so you better be a good example to your brother and sisters because they are constantly watching you”. So I do discipline him more often than the other 3, I have to admit. Of course, I have mommy guilt. All.The.Time. Sometimes I feel like I treat him more like an adult than a child, as I expect him to know EVERYTHING and do the right thing – which of course, is a really silly thing to do. And with all that expectations, Michael has been nothing short but a responsible, kind, loving and helpful son and brother to his siblings. He has helped me to tidy up, brings a diaper for Hannah when I need one, runs his baby sister’s bath or the bigger bath (for him and his other siblings) and he really does look out for them as well no matter where we are. As grateful as I am to Michael, unfortunately, I have noticed that I’ve been giving more attention to my younger children than to Michael. Or spending time on Netflix or on my phone – reading, checking emails, replying to my clients etc. Then, mommy guilt kicks in. Again. I know we all moms do this. But a little guilt is good sometimes to keep ourselves in check and keep us in line with what’s more important. I needed to spend more time with Michael. And do less of the not-so-important stuff. I needed to talk and to listen to him. And give him the time to be himself. To express himself. And I decided to do just that. Michael did not have school today (Friday) because there was a Teacher-Only-Day at his school. So we’ve decided to go for morning tea. I asked him what he wanted and where he wanted to go. He wanted a chocolate cookie. I also got him a drink while I got myself an almond-cappuccino (yum!) 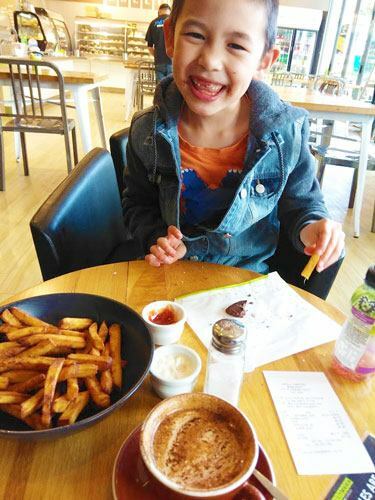 while we shared a plate of hot kumara (sweet potato) chips. I made an effort not to use my phone during this time. So we talked about a number of things. Sometimes we were just being silly as we talk nonsense while he tells me about what he does at school. We laughed a lot too. Then, we went to the park after that and he played his heart out. When we came home, Michael was skipping as he head towards the front door and he was beaming from ear to ear. This just confirms my resolve that I have to make an effort to spend quality one-on-one time with each of my children because it is SO important for their emotional health. And while it is a real challenge to do it with 4 kids, seeing Michael’s response today has made it easier for me to want to do this. I never wanted to take Michael’s feelings for granted and I wanted to show him just how much I love him and appreciate all he has done for us and the family. And as much as I want to spend that time working, spending this time with him was worth it because I’m giving him a portion of my life which I will never get back. “Mom, I feel so happy and lucky today. I love you, Mom”. 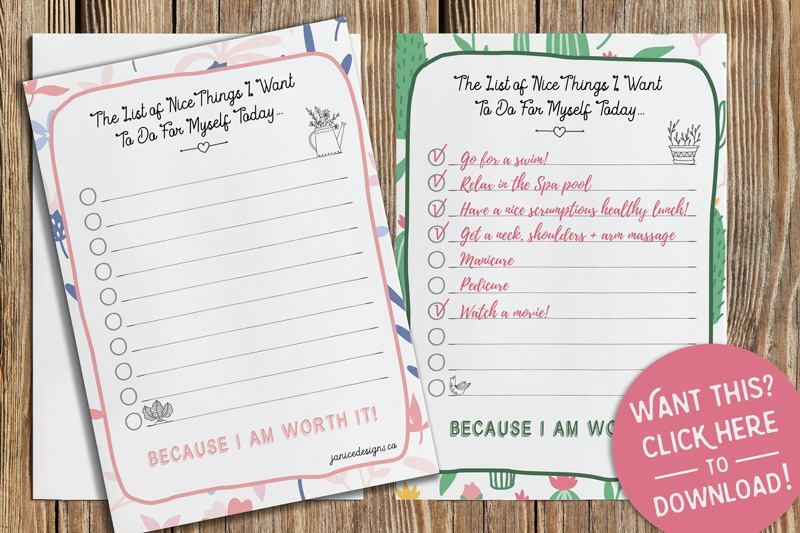 You need to be a subscriber to download your free printable below. Click the image below or access to my Free Printables Library right now if you’re already a subscriber.